The second annual “Chef of the Year” Award presented by Wild American Shrimp®, the American Shrimp Processors Association (ASPA)’s marketing program for wild-caught Gulf and South Atlantic Shrimp, was awarded on Friday, October 19, 2018, to Chef Tenney Flynn, Chef/Owner of GW Fins in New Orleans, Louisiana. Chef Flynn will reign for the next year as the organization’s “Admiral of Advocacy” and lead efforts promoting the benefits and quality of wild-caught, American shrimp. Chef Flynn has become known as one of the country’s foremost seafood experts, as well as a vocal enthusiast for the bounty of seafood that is available in the Gulf during the past seventeen years of co-owning legendary New Orleans fine dining seafood restaurant GW Fins, which has been rated as the #1 restaurant on Trip Advisor for the past three consecutive years. Growing up cooking in his father’s restaurant in Stone Mountain, Georgia, Flynn developed an innate understanding of Southern food and culinary traditions. From there he received his formal training at the Culinary Institute of America at Hyde Park. Chef Flynn officially began his fine dining career with Atlanta’s esteemed Buckhead Life Group, cooking at such famed restaurants as Pano’s and Paul’s, Fishmarket at Lenox and finally as Executive Chef of Chops. Ruth’sChris Steak House then recruited his talents as the company’s Director of Culinary Operations, a position he held for seven years. 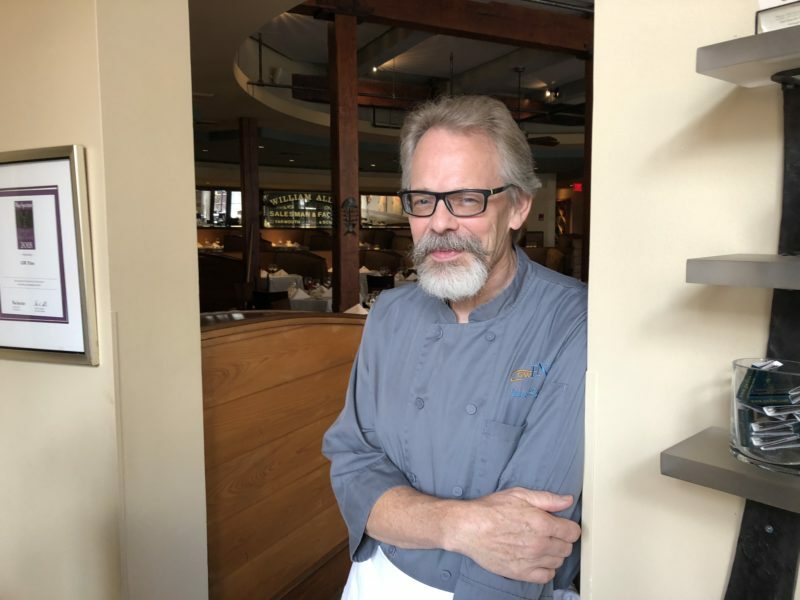 Since launching GW Fins in 2001, Chef Flynn has developed a reputation as one of the most knowledgeable and discriminating seafood chefs in the country. Chef Flynn is a master of his craft and his wealth of knowledge and passion about seafood is unmistakable. He is a seafood icon, asked to judge national seafood competitions and provide cooking demonstrations for fellow chefs and consumers. Chef Flynn has become a national celebrity for his weekly cooking segments on the syndicated fishing show, “The Big Fish.” In fact, often guests come to New Orleans to dine at GW Fins after watching him prepare a variety of dishes on this popular show. For nominations to be considered, each chef had to demonstrate their support for the wild-caught, domestic shrimp industry through various media and public relations vehicles, showcase two or more recipes utilizing Wild American Shrimp, show involvement in community philanthropic activities and food advocacy programs, as well as showcase any culinary awards of excellence, especially in the area of seafood. Nominations were received from all over the United States. The nominations were reviewed by a committee designated by ASPA Executive Director, Dr. David Veal along with members of the Wild American Shrimp marketing team. The decision was tough with several finalists named including Chefs James Aptakin, Chef/Owner, Layers of Flavor, Honolulu, Hawaii; David Guas, Chef/Owner, Bayou Bakery, Coffee Bar & Eatery, Arlington, VA; Michael DiBuono, Chef/Owner, Sea Level Oyster House, Cleveland, Mississippi; and Austin Sumrall, Chef/Owner, White Pillars, Biloxi, Mississippi. Flynn received prizes to include a customized award plate and official proclamation as well as $500 donated by the American Shrimp Processors Association to a charity of Chef Flynn’s choosing. The Wild American Shrimp “Chef of the Year” is an annual award that is announced each October during National Seafood Month. The Association has an ongoing Chef Advocate program for chefs who prefer and promote Wild American Shrimp and welcomes those interested in becoming a Wild American Shrimp Chef Advocate to apply HERE. Click here for more information about ASPA.